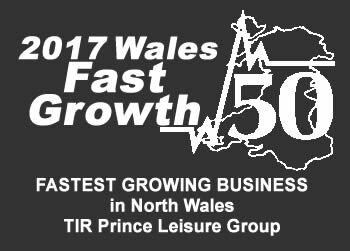 Tir Prince Leisure Group has won the Fastest Growing Company in North Wales for the second year running at The Fast Growth 50 Awards at the Motor Point Arena in Cardiff on Friday night. Growth of 296.3% secured first place for 2018 and Managing Director Adam Williams was delighted with the result. He thanked his wife Alison and all of the team for the result and finsihed by saying heres to next year and heres to Wales! Tir Prince Lesiure Group finished 11th in the whole of Wales up from 18th last year.